Your current pair of safety footwear is not bad, but it is not good enough. And now you have almost begun to feel the need for a new pair of shoes that turn up a lot better than your existing safety shoes. We’d suggest you a pair from Warrior. Why, you may ask. Well, let us tell you that every pair of Warrior safety shoes is built to fit well and look good; moreover, these shoes are light in weight and can absorb shocks of up to 200 joules! Warrior shoes are built of top quality materials; that is why, the shoes last long and more importantly, enable the wearer go about his or her work with the least concerns for their feet safety. 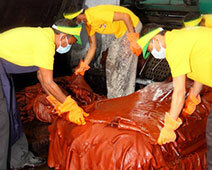 •Leather – real leather goes in the production of these shoes. •Cordura – this is a highly breathable fabric that is used for certain parts of the upper or ankle of the Warrior shoes. •Cambrelle – the lining ensures greater comfort and hygiene, and thus helps in preventing the growth of bacteria. •Water proof membranes – the membranes keep moisture away from the feet and provide greater breathability; this ensures that the wearer can work for hours with Warrior Shoes up. •Spacer fabrics – this 3D or three dimensional lining ensures greater ventilation and comfort for the feet. 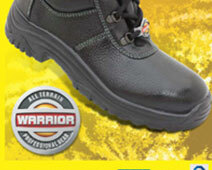 •Footbeds – this again ensures the end product – which is Warrior safety shoes – is nothing short of incredible.